Top business leaders, politicians and campaigners are on their way to the World Economic Forum in Davos - to network and to discuss topics from open source software to Iraq's reconstruction. Mike Rake will tell News Online readers in a series of diary reports what he is getting out of the meeting. The first day of the annual meeting of the World Economic Forum in Davos is not usually noted for opening with a bang, but it did on Wednesday morning. Several, to be precise, rumbled around the mountain resort as Swiss ski safety experts set about their business of clearing overhanging layers of heavy snow to avert potential avalanches. The bangs had nothing to do, we were assured, with any of the numerous protests that have been threatened. Reassuringly the obvious security presence has been polite but firm. For those coming as an excuse to ski - well it is too cold and snowy with temperatures of minus-16C. Even I don't fancy heading out for the piste as a way of occupying the small amount of free time that I will have to myself this week. Besides, there's no way that I would miss out on listening to one of the most eloquent speakers of our time. No matter what political bias any of the delegates may hold, the address by the former President of the United States, Bill Clinton, is a must attend. His ability to speak for an hour or more without the aid of notes or an auto-cue is legendary. So too are his remarkable delivery skills and command of language. As ever his finger was spot on the issues, all captured under the umbrella of a big theme: "Globalisation versus anti-globalisation - insularity, interdependence, integration." This is not a time for taking written notes - this is a time for listening and imbibing his thoughts. My immediate take from Bill Clinton's address was his quotation: "Antis go on about the good old days - were the good old days really good?" The important points he made were that there needs to be a systematic way to deal with the issues surrounding poverty, wealth, health, and water. Co-ordinated action, not lip service, is what is needed. 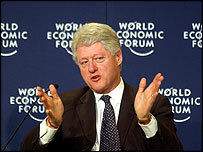 Bill Clinton's words will no doubt be well covered by the world's media. So too will scandals, particularly those of a corporate nature. Corporate governance has been high on my agenda for two years now, kept in a prominent position by a series of financial disasters and alleged unethical behavior by high-profile executives. I attended an encouraging session on the subject of corporate governance, which was covered well and with much common sense by the panel members. It was very refreshing. We need to examine in great detail the future culture and focus of companies, along with the role of board directors, both executive or non-executive. There is a need to compare excessive regulation and box ticking versus business performance. Principles are better than rules for corporate governance and the right balance must be sought. The danger is that boardroom will become a place to tick boxes, and not a place for strategic thinking - the potential impact on business performance is not worth thinking about. It will also be interesting to hear the thoughts this week of the co-chairmen of The Trans Atlantic Business Dialogue (TABD). Doug Daft, also chairman of Coca-Cola, and Niall Fitzgerald, chairman of Unilever, are aiming to inject fresh life into the TABD in order to prevent businesses from being adversely impacted by the amoeba-like production of red tape around the world. What was that about ticking boxes? One man who needs no introductions at Davos is George Soros, chairman of Soros Fund Management. He's well known, amongst other things, of sending the occasional shiver through financial circles. George will give us his insights into how he thinks the world economy will evolve over the next few years. I look forward to hosting this occasion, and reporting his views later this week.